Nu metal was so 10 years ago. You know it and we know it, but apparently, no one knows it more than Korn, one of the pioneers of the genre, who are embracing dubstep on their forthcoming album, The Path Of Totality. 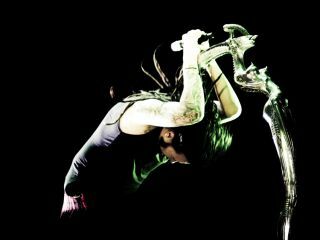 Frontman Jonathan Davis led the band into the world of dubstep. Said bassist Fieldy, "Jonathan loved it [dubstep] and he just got us into it. We feel it's important to stay current and keep on top of what's going on." To that effect, the band worked with producers such Excision, Datsik, Noisia, Kill The Noise and 12th Planet. And as for their pairing with Skrillex, it's already yielded the album's first single, Get Up! (check it out above). When Davis and guitarist James "Munky" Shaffer joined Skrillex on stage at Coachella last April for an unannounced performance of Get Up! the impact was immediate, resulting in over 150,00 downloads and 2 million views for the lyric video. "Get Up! started as a bit of an experiment," said Munky, "but we had such an amazing response from our fans and had such a great time collaborating that a full album of tracks came together in a couple of months. We couldn't wait to get to the studio every day to finish the next song."